So, I am obsessed with local coffee shops and luckily for me, Geneva’s coffee scene is expanding by the day. 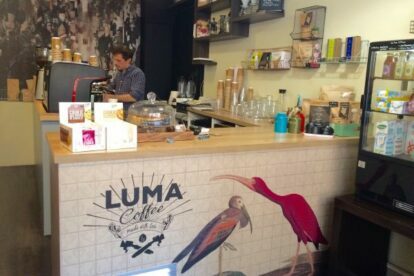 One of the latest addition is Luma Coffee. Luma should be on every coffee lover’s list. In Luma, the time slows down, almost to a stop, there is no rush to anything anymore. Their back room is the perfect place to go study, work, read a book, hang out with a friend or just dream and relax on a rainy day. Luma will make you feel creative and artsy. It is small and cozy with a quirky but cute decoration. The coffee is excellent. The owner is nice and friendly. Luma is one of those places where you instantly feel welcome, almost at home, in a cocoon. You can take their coffee to go and head for a stroll around the Lake or in the Parc de la Grange nearby on a nice spring day. You can also just sit back, breathe and take the time to do nothing. People should try sometimes, it feels amazing. However, I must admit that there are two negative points to Luma: it is unfortunately not open on Sunday, yet (I tried to convince the owner to do so one evening, while sipping champagne at Elua’s opening party next door) and it does not have many food options. But the owner told me he was working on both these issues.